Dell Wyse, the company's cloud services arm, is worried about your security. It's also thinking that it's time you didn't need to drag that laptop wherever you go. As such, it's working on Project Ophelia, a chunky Android stick that turns any HDTV or monitor into a display. What's different to devices like FXI's Cotton Candy, for instance, is that the hardware is a gateway to a cloud server where all of your content lives. Users can play games, display presentations or finish the last few lines of that essay wherever they are. The company isn't talking about details (or how you'd control such a device), but it's expecting to have it ready for prime-time by the summer. LAS VEGAS, Jan. 8, 2013 – Dell today unveiled a solution that extends the value of cloud client computing to the next level, enabling people to manage the increasing convergence of their work lives and personal lives by using a compact, portable device to access not only secured professional assets, but also personal content via the cloud. 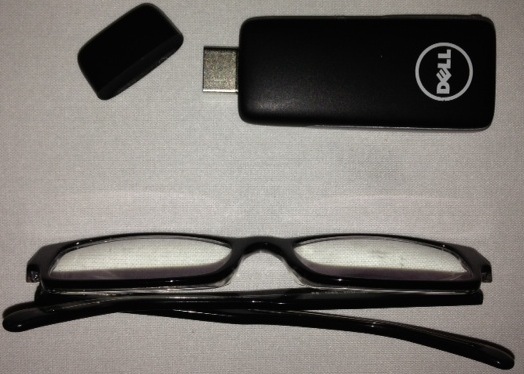 The ultra-compact multimedia-capable device, called Dell Wyse "Project Ophelia," is slightly larger than a USB memory stick and enables users to convert any capable TV or monitor into a functioning interactive personal display device without using a computer, tablet or smartphone. Built on Dell Wyse software technology already used on millions of devices, Project Ophelia transforms ordinary displays into a window to entertainment, communications and a person's own personal cloud. The device also allows business users to instantly turn a display into a flexible, securely managed, communications-enabled thin client for work, demos or presentations. These capabilities are packed into a device barely larger than a USB stick that is self-powered through a monitor and easily fits inside your pocket. to the monitor's MHL port, or separately via its own USB interface. No batteries to charge or change. entertainment stations – all managed easily by IT via Dell Wyse Cloud Client Manager."